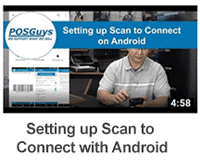 POSGuys.com: Your barcode scanner, receipt printer, and point of sale super store. System Financing Available - Starting as low as $55 a month. Complete POS systems come with 1 year warranty and POSGuys lifetime hardware support. 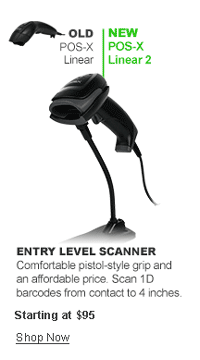 Barcode Scanners are broken down into four separate sections for specific needs. 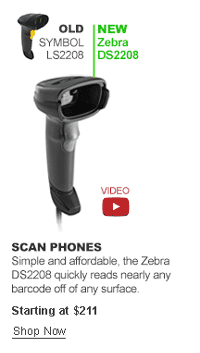 Retail Barcode Scanners cover the handheld and cordless scanners best suited for retail environments. 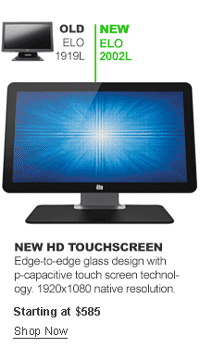 Presentation Scanners are more aggressive and designed for higher volume retail or grocery environments. 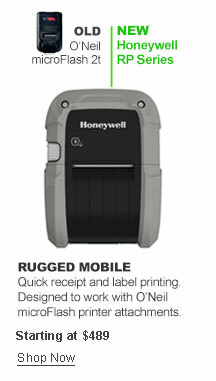 Industrial Barcode Scanners feature heavy-duty designs ideal for rough or hazardous locations. Point of Care Barcode Scanners are designed to withstand cleaning and sanitization needed in the healthcare environment while at the same time improving accuracy and patient care. A complete restaurant POS System including hardware and software. Searching for a complete POS system? 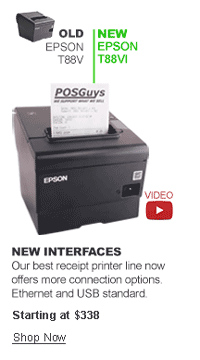 Need a receipt printer or barcode scanners? 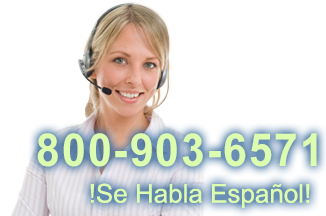 Call our friendly, knowledgeable sales staff at 800-903-6571. They are ready to answer your questions. 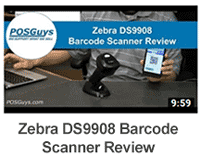 When it comes to barcode scanners and POS equipment, we are the experts! POSGuys.com employs a full staff of expertly trained phone support technicians. From basic installation of a barcode scanner to networking multiple POS Systems, they are ready, willing, and able to find you a solution. Live support available Monday through Friday. Extended on-call hours also available per incident. 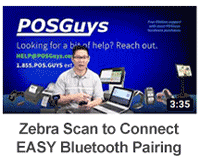 POSGuys.com provides lifetime support for many of our products including barcode scanners! Most orders placed before 3PM PST (6PM EST) M-F will be shipped that same day for free. Some restrictions may apply see shipping policies for more information. POSGuys.com delivers the best service, support and knowledge in the industry. Let our expertly trained staff help you in creating a solution that saves you time and money at your business. From retail sales operations to advanced warehouse inventory management, we have the skills and experience to find exactly what you need. 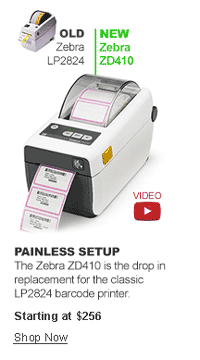 We offer barcode scanners from industry leaders including Zebra, Symbol, Datalogic, POS-X, and Honeywell. Regardless of your data capture needs, these manufacturers have a barcode scanner built for you. Our barcode scanner offering is split into three major categories: Retail Barcode Scanners, Omnidirectional Barcode Scanners, and Industrial Barcode Scanners. For the most part, a retail barcode scanner is going to work in 95% of applications, a smart choice for easy scanning of low to even high volume retail businesses. Our omni directional barcode scanners are fast and aggressive, fantastic for grocery, high volume retail, or even manufacturing. Industrial barcode scanners offer advanced durability, able to handle extreme temperatures and abuse that occurs in heavy industrial, shipping, or field service environments. From our years of experience and expertise, POSGuys.com has consolidated the leading point of sale hardware and software solutions right here. We’ve even done the leg work, testing and rating POS hardware and barcode scanners to make the research easy for our customers.